<>, Inspire-O-Gram, "Fr:ee MP3 Bibles!" You're receiving this free ezine because you signed up for it at www.inspiration-for-singles.com--which proves how brilliant, sophisticated, and gorgeous you really are! Welcome to the May 2008 edition of Inspire-O-Gram! We've got two great fre:ebie offers for you this month, both absolutely gratis. I know you'll enjoy them. Before we get into those, our feature article this month is a bit...different. I'd like to get this article placed on the social networking site Digg. If you'd like to help, simply click on the bookmark button at the end of the article about Life without God, then click on the Digg button and follow the instructions. Thanks for helping me spread the word! Here's a doozer of a fr:ee offer. While roaming Christian sites recently, I ran across some f/ree MP3 Bibles. Not only are they my favorite price (f:ree), but they're available in a bazillion languages. Holy Tower of Babel, Batman! I put together a special page so you can just follow the links, then choose the version in your native tongue. Oh, and at the bottom of that same page, there's a BONUS you're going to love. So make sure to scroll down to the end and take advantage of that other fr/eebie too! for God doesn't exist, you know. "All dressed up, and no place to go." This month's quotation comes from English writer and part-time curmudgeon G.K. Chesterton, from his 1922 book, Where All Roads Lead. Chesterton wrote about 80 books in his lifetime, several hundred poems and nearly 4,000 essays. Christian writer C.S. Lewis said Chesterton's book The Everlasting Man contributed to Lewis's conversion to Christianity. Lewis called the book "the best popular apologetic I know." This month my offer for my ebook, Single & Sure, features a fr:ee preview excerpt from Chapter 6, "How to Create Your Future." Not only that, but you can also read the complete Table of Contents of Single & Sure. You'll discover how to overcome loneliness, how to climb out of depression, how to repair damaged self-esteem, and how to laugh again. You'll appreciate the simple, common sense approach, and you'll be able to apply these solid principles to your life immediately. 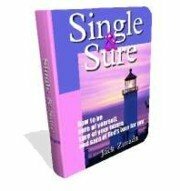 Single & Sure is available only through ClickBank, which takes major credit cards and PayPal. If you don't own a credit card, you can ask a friend to charge it then pay her back. Loneliness is a problem all singles have to deal with. From what I'm told, married folks encounter it too. Do you see overcoming loneliness as an impossible task, too overwhelming for you to tackle? Maybe you'll gain a new perspective after you read these thoughts on overcoming loneliness..."
That winds up the May issue of Inspire-O-Gram, and I hope it provoked a thought or two inside your noggin. I always enjoy your comments, which you can blast out to me using this hypoallergenic contact form. Until next month, thanks for reading and remember Jesus's words that apply especially to us singles: "And surely I am with you always, to the very end of the age." (Matthew 18:20).